The Bunker can only be reached on foot, and is situated in a wood near the village. It is signposted "Bunker" or "B" . During the Nazi occupation, Resistance membres built the underground bunker in which they hid refractories. 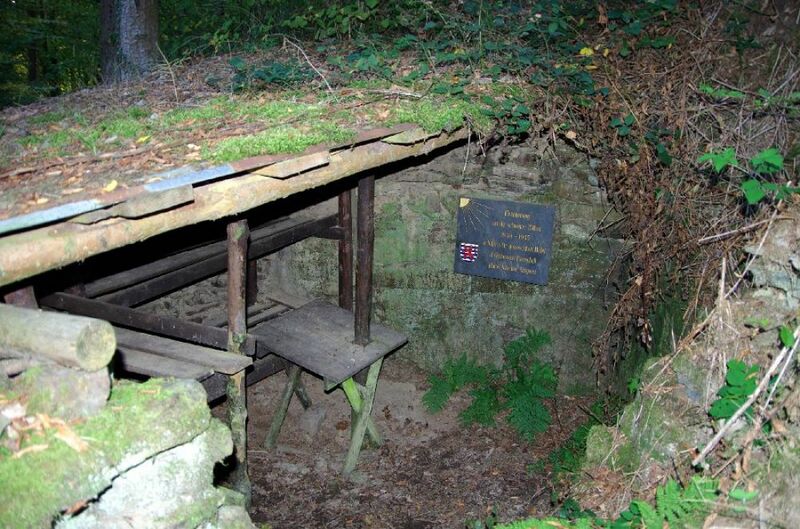 In all, five bunkers were used during the German occupation of Kaundorf. The "an der Runschelt" bunker was restored in 1987, and has been a protected monument since then. At Whitsun in 1944, this bunker, situated in a crevice, contained 4 hidden refractories which were previously in the Nickels-Jans house. In gratitude to all patriots, who were able to rescue many refractories from the Nazis, there is a memorial plaque.